We all have good causes that we support. 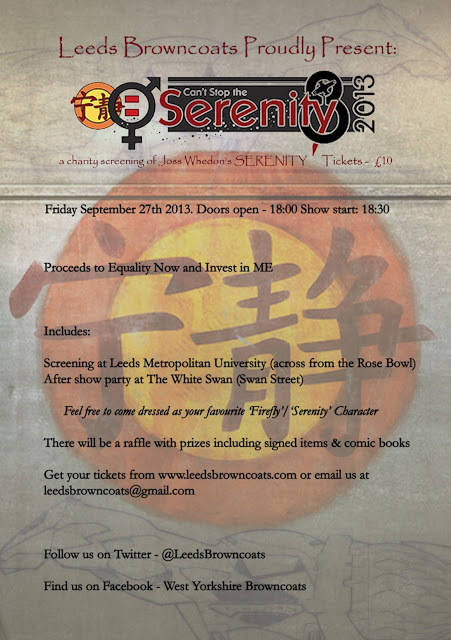 Invest in ME and Equality Now are two excellent charities and they’ll be the recipients of proceeds from a screening of the Josh Whedon film Serenity that’s being organised by Leeds Browncoats on Friday, September 27 at Leeds Metropolitan University. The film starts at 6.30 pm, and doors open half an hour before. Tickets are £10, and there will also be a raffle of autographed items and comic books. There’s even an after party at the White Swan down on Swan Street. Now, I’m not a browncoat (admission time, I don’t even know what they are) and I’m not a big Whedon fan. I’ve watched some episodes of Buffy and that’s about it. But friends have been involved in setting this up and getting out the word and I’m glad to help them. Serenity, for those who, like me, don’t know, is a science fiction film that follows on from the Firefly television series. You get extra points for turning up as someone from Firefly or Serenity. Please, do go down and support this.